Luan refers to a common type of plywood in the United States. 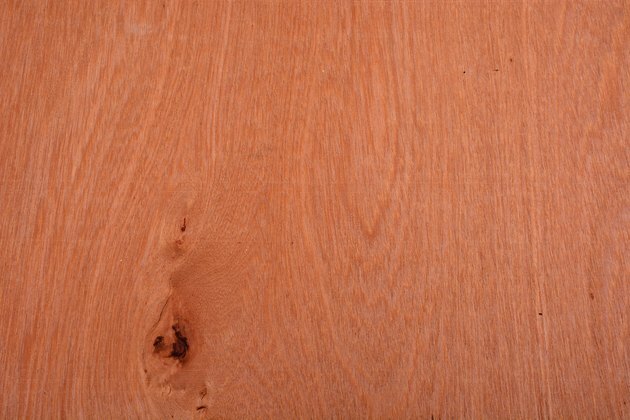 It goes by many different names: Philippine mahogany, meranti plywood or the alternative spelling lauan. Luan wood comes from trees of the Shorea genus, of which there are 196 species. Luan plywood originates from southeast Asia and was first manufactured in Japan, Korea and Taiwan in the 1960s and '70s. By the 1990s, Indonesia, Malaysia and the Philippines were the luan plywood manufacturing capitals of the world. Since that time, the luan wood industries in these countries have declined due to poor management of the hardwood forests. Some of the individual Shorea species originally used to make luan plywood are no longer available due to overharvesting. Although luan plywood manufacturing is not the booming industry it once was, luan continues to be a popular wood with many different applications. What Makes Luan Plywood so Popular? Luan plywood offers benefits for both the manufacturers and the consumers. The trees in the Shorea genus are tall and straight, meaning very little waste is generated during harvesting and peeling. It also offers a consistent density and color during the manufacturing process, which makes it more appealing to consumers. Luan plywood offers tough flexibility even when made into thin sheets for underlayment, yet it remains soft enough to cut with a utility knife. It is dense and stiff and has a high bending strength, but it has a low hardness score. This means it is an easy material with which to work and is easy to install for both professionals and DIYers. It also is already quite smooth and looks great when stained, so it is ideal as a finishing wood for certain projects. Also, due to its incredible ability to bend without breaking, it makes an ideal wood for humid areas where expansion and contraction occur in the wood on a regular basis. How Is Luan Wood Commonly Used? Because it is strong but lightweight, luan wood is often used for interior doors, ceilings and walls as well as furniture backing and drawer bottoms. It also represents one of the most popular underlayment materials used under vinyl flooring. The large sheets are easy to move without being too heavy or snapping when bent. Because they can be cut with a sharp utility knife, cutting these underlayment sheets to size is also quite convenient and easy. Luan plywood also remains a popular option for exterior projects, including boat building. In this industry, it commonly goes under the name meranti or Philippine mahogany. Both of these refer to a mix of Shorea species, the same used for luan or lauan plywood. Unfortunately, the luan wood industry in southeast Asia rose and fell quite rapidly. Deforestation in this region has been an ongoing problem. Because trees take years or even decades to mature, logging companies need to have a smart strategy for replanting and sustaining the population of trees. Unfortunately, that has not happened with the luan wood industry as a whole, and the trees used to make this plywood are declining in population. Thus, a variety of trees from the Shorea genus tend to be mixed together to make luan plywood. The appearance of luan plywood in different shipments can vary due to this. Alternatives to luan plywood include recycled products like agricultural residue panels or temperate hardwood plywood, which is sourced from nonendangered forests in Scandinavia and North America.